The following ideas come from "Let There Be Light" Bible Lesson on The Resource Room. This coloring sheet goes along with the Bible Lesson "Let There be Light". 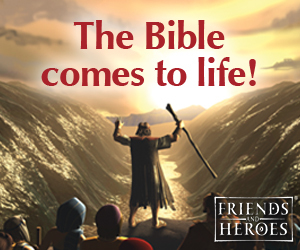 Use it as an early arrivers activity or Bible verse review activity. 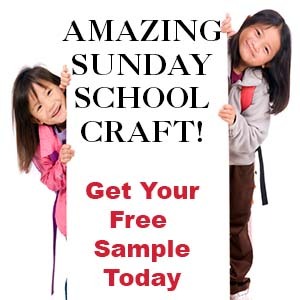 Print out the postcard and send them to children who could not attend that week, or use them as Bible verse cards. 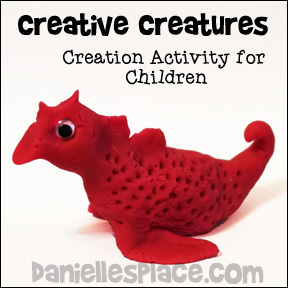 Give each student some play dough and instruct them to "create" a creature that isn't like any creature they have ever seen. When they are all finished have them share what kind of creature they made. 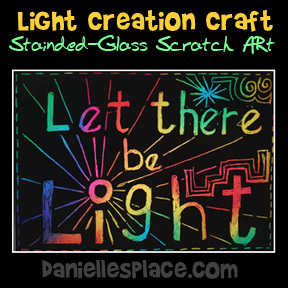 Give each child a piece of Scratch Light, Stained Glass and have him or her scratch off the black coating to reveal the beautiful colors hidden below. 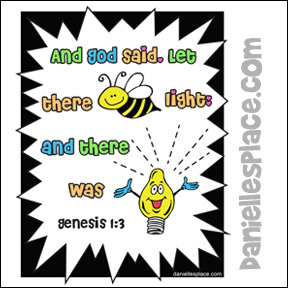 Encourage your children to write "Let There be Light" somewhere on the sheet. To save money cut the larger sheets in half. This will still give your children plenty to work on. Tape the finished paper to a window. Hey!!! I'm a teen age girl who teaches the young kids at my church. It is enjoyable but sometimes difficult to find interesting stuff to do. I want to commend you on your sight VERY much!!!!!!! It's AWESOME!!!!! It has the cutest ideas and everything! It is completely amazing. No joke...you have the BEST site for this that I've ever seen! Thanks VERY much for having it out there! It's great and keep up the great work! Thanks again and I LOVE your site! Before class glue 9" pieces of strings to the print side of old CDs. Glue CDs to the backs. 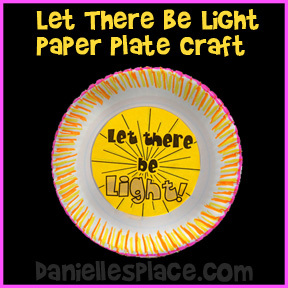 Print out the "Let there be light" patterns onto brightly colored paper and cut them out. You will need two CDs for every suncatcher. 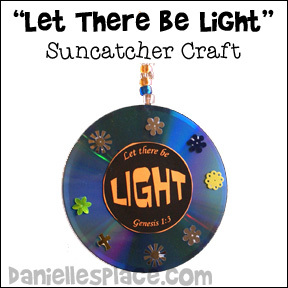 In class have your children glue the "Let there be light" patterns onto the back and front of their sun catchers and then glue sequins onto the sides to finish. 1. Before class print out the day and night picture and loosely cut them out. 2. Cut the blue construction paper in half and glue a half sheet of blue construction paper on the black construction paper to make a half black and half blue sheet. 3. 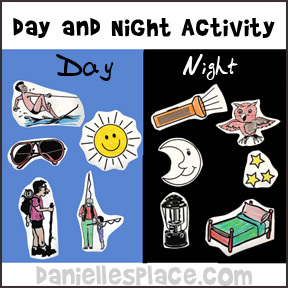 Write “day” on the blue side and “night” on the black side. Have your students color the pictures and glue them onto the correct side of the black and blue paper. 1. Before class print out the "Let There be Light" Patterns onto white paper and then make copies onto bright paper. If you are using a laser jet printer you can print them directly to the paper. If you are using an ink jet, use a copier because the ink will smear when using the oil. Note: If you don't have a pattern, you can just let your children use black Sharpie markers or crayons to write "Let There Be Light!" on the bright paper. 2. Cut out the center part of the paper plates. 3. In class have your children color the picture and then paint a thin layer of oil over the pictures. Place the picture between layers of paper towel to soak up any excess oil. 4. After about ten minutes glue the pictures to the back of the the paper plate. 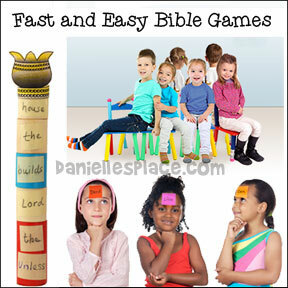 Play "Let There be Light"
Have your children sit on the floor facing the front of the room. Pick one child to be "it". "It" goes to the very front of the room, facing the wall with his eyes closed. Point to one child who is sitting on the floor to get up and move to a new position. Then every one says, "Let there be light". The child at the front of the room opens his eyes and turns around and tries to guess which child has moved from his place. If he guesses correctly, he switches places with that child. If this is too hard for your children, pick a child to sneak up and tap the child in the front of the room on the back and then sneak back to his place. Then say, "Let there be light", and have the child guess who tapped him. 2. In class show your children pictures of shadow puppets. Let them practice making shapes with their hands. 3. Tape a piece of paper to the wall and have a children make a shadow puppet on the paper. Have another child trace around the edge of the shadow. If you have very young children, you can just make the shadow puppets for them and have someone draw the shapes and then give the drawing to the children to color and add details. 4. 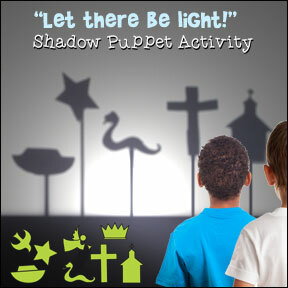 Write "Let there be Light" at the top of each shadow puppet picture. Caution: Spotlights and projectors can get very hot, so make sure you have someone guarding the light as the children play. Place the light on a table and have your children sit on the floor in front of it. Preparation: Before class print out the shadow puppet shapes and glue or tape them to craft sticks or straws. 1. Have your children sit facing a light-colored wall. (If you don't have a light colored wall, you can tape large sheets of white paper to the wall.) Set up the projector or spotlight so that it is behind your children. 2. Place one of the shadow puppets in front of the light so that it's shadow displays on the wall. Ask your children to guess what the shape is. Then ask your children to say how the shadow relates to the Bible. 3. 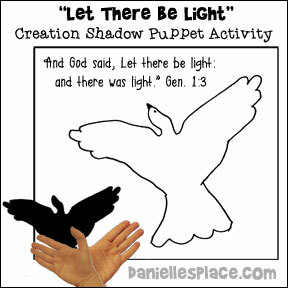 When you have gone through all the shadow puppets you can let your children play with them experimenting how they change shape as they move them closer and farther away from the light source, or when they change the angel of the puppet. 4. Children may also what to make their own shadow puppets or make hand shadow puppets. (Second Grade and Older) - Give each child a sheet of paper and a pencil. Tell them that they are going to draw a creature like none they have ever seen. Tell them to draw on feature on their paper such as a head, eye, arm, etc. When every one is finished drawing the one feature, they should pass their papers to the person on their right. Everyone them draws one feature of the creature on that paper and then passes it to the right. When the papers make it all the way around the table and back to the original artist, give the children time to finish the drawings. Let your children name the creature and share their finished picture to the class. Give each child a glow-in-the-dark bracelet, necklace, or other object. Tell the that you will be turning off the lights. Turn off the lights and sing some songs.